Book Review – Our Place: Can we save Britain’s wildlife before it is too late? Our library member Katharine Mair has recently enjoyed this new addition to our library, and her review follows. This is a timely book with a grim theme. It is also an easy and engaging read. Mark Cocker is a working naturalist, who draws us into his own experience of delight in the living landscape that we share with other creatures. In addition he gives us a lucid account of the work of many individuals and organisations who have, over several centuries, worked to preserve threatened species and landscapes.This combination of personal anecdote and historical perspective tells us why we should be concerned, and highlights the many conflicts of interest that can get in the way of change, modern farming methods being just one example. The title of this beautifully written book asks a question. To me it suggests the answer that we must never give up hope and stop trying. Due to staff illness the library will be closed on Saturday 23rd March. We apologise for any inconvenience. The library we re-open as usual on Tuesday. If you go through the green baize door into the Reading Room at the Morrab Library, you will see in front of you a shelf with the title “WHAT YOU CAN FIND IN THE MORRAB” The selection of books displayed will change approximately every month. It is intended to demonstrate the wide range of material that the Library holds. Piracy is as old as history and as wide as the ocean. We have all heard of the pirates of the Caribbean, but what of the Barbary coast, the South China Sea, the Indian Ocean? Where there is water there is piracy. For some reason, pirates have been given a romantic image; they share it with highwaymen and some of the more colourful modern villains. That the reality was bloody, vicious and horrible has not put us off. These books show both sides of the story. Treasure Island by Robert Louis Stevenson: Truly iconic, because it creates the image of the traditional pirate, wooden leg, eye patch, parrot on the shoulder, yo-ho-ho and a bottle of rum. Read it again, the true story is much darker and deserves its status as a classic. Edward Lear’s Illustrations of the Family of the Psittacidae: Well, why not? Lear’s beautiful pictures of parrots are a joy. Any one of them would grace the shoulder of the blackest pirate. Philip Gosse’s History of Piracy: He of the son of the son of “Father and Son” and wrote a comprehensive history of piracy, dating from B.C. and covering the globe. A good place to start. Pirates by David Mitchell. One for the teenagers who want to buckle their swash. Histories of Herodotus: This tells us of Dionysius the Phocean who started life as a soldier but got bored with peace and specialised in attacking Carthaginian shipping. The Anglo-Saxon Chronicle: Were the Vikings pirates? By a strict definition, no; piracy takes place on the high seas and between ships. The Vikings plundered isolated settlements such as monasteries, but their victims called them pirates, and they should know. W.S.Gilbert’s Pirates of Penzance Included purely for alliteration – our town is named only once in the libretto, but ah my foes and oh my friends, it gives a lovely light. Just think, it might have been Penge. Aubrey Burl: Better known for his books on the standing stones of Britain, Burl has produced a well documented and splendidly titled book Black Bart. Bartholomew Roberts, a pirate whose extraordinary career out-fictions fiction. Frank Shay – Mary Read, the pirate wench: Women were pirates too. This is a fictionalised account of a true story of two ladies (Anne Bonney was the other) who were every bit as resourceful and bloodthirsty as their male colleagues. Harry Kelsey – Sir Francis Drake, the Queen’s Pirate. Drake was a privateer, a licensed pirate in that he operated under letters of marque from the government. Thus entitled to seize enemy shipping, he tended to interpret the rules rather liberally, but this did not prevent him from making a major contribution to Queen Elizabeth’s treasury. Philip Payton (ed.) 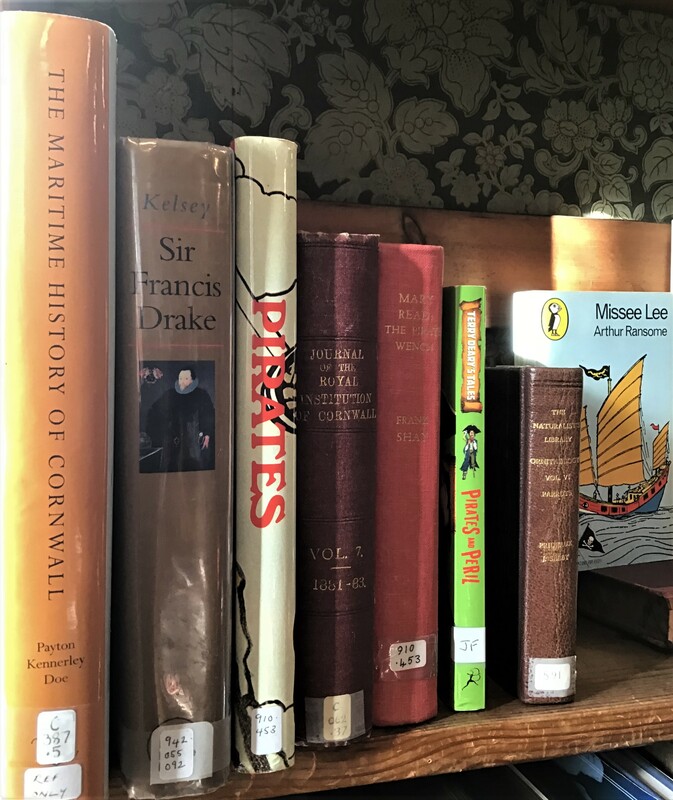 – The Maritime History of Cornwall: For centuries the only practical way of getting to and from Cornwall was by sea; there were no roads to speak of, and coastal traffic was the county’s lifeline. The book tells how the lifeline was seriously threatened by pirates, from the North-West coast of Africa, the Barbary Coast. Cornwall’s home grown pirates were numerous and well protected by the community. This blog is too short to list them but Lady Mary Killigrew must represent them – spoiler alert- she got away with it. Arthur Ramsome’s Missee Lee: I make no apology for reintroducing my favourite fictional character. 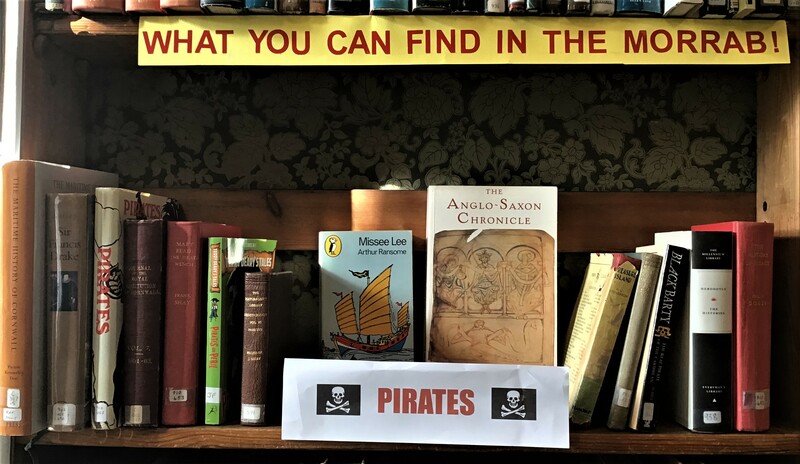 What better than a Cambridge educated female Chinese pirate with a penchant for Frank Cooper’s Oxford marmalade?! 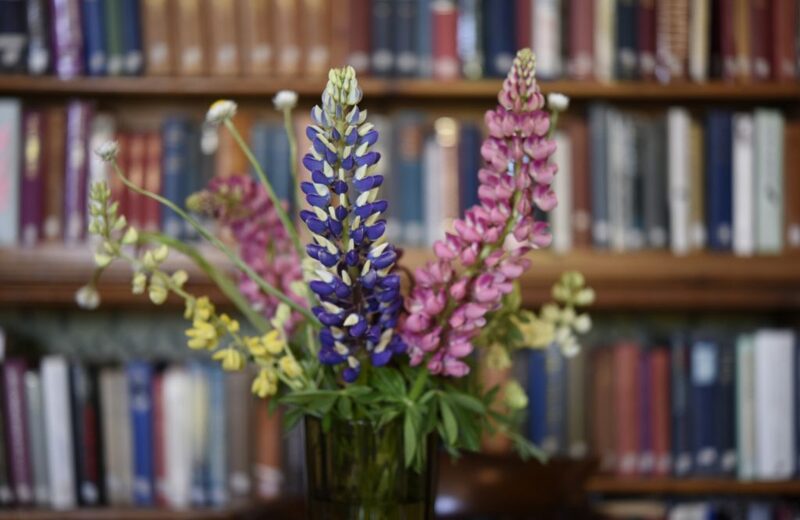 We’re extremely sorry to inform you that the Council have closed the gardens due to the weather forecast, and therefore the library will be closed today, Tuesday 12th March. If the weather improves dramatically over the course of the day, and the garden gates are unlocked, then we may be able to re-open, and we will send another message if this is possible. Otherwise, we are hoping that full service should resume tomorrow, Wednesday, although this is subject to the weather improving and the Council deeming the gardens to be safe. With many apologies for the inconvenience. Our latest blog features a review of one of our library treasures from a member, Dave Hill. He loved PAMIR – A Voyage To Rio In a Four-Masted Barque by Hilary Tunstall-Behrens, published in 1956. Hilary was still young when he signed on to sail in the Pamir in 1951 although he had seen service in minesweepers in WWII and also been an instructor in the Outward Bound movement. 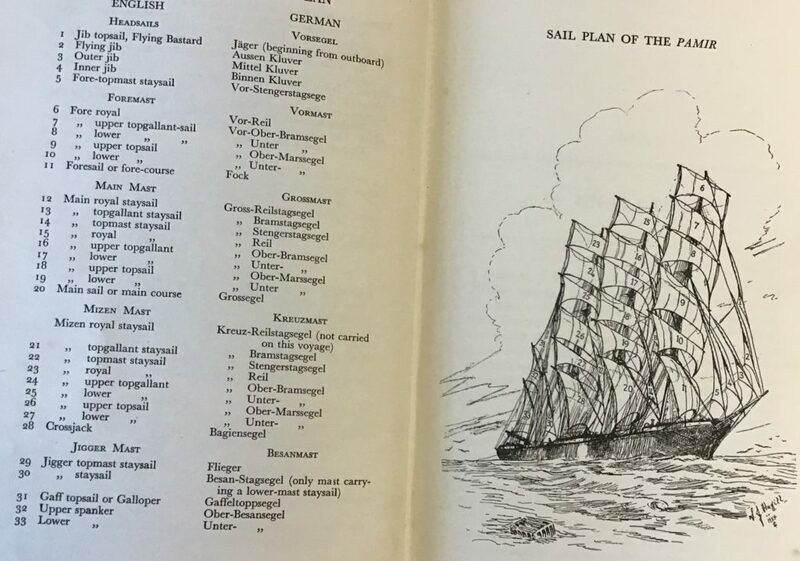 His book gives a personal account of this, the first sail training voyage, along with a glossary of sailing terms for the less nautically minded. His companions on the voyage were young German and English cadets and a few skilled hands, many refugees. But all had to learn as they went along, each sailing ship was different, especially one as big as the Pamir. The steel-hulled Pamir had been built in 1905, was 375’ long and one of the famous “P Liner” sailing ships. She had a chequered career in the nitrate trade with South America and then carrying grain from Australia, she had also been seized in both World Wars. Scheduled for the breakers yard she was bought along with her near sister ship the Passat by a German shipowner and both were refitted as sail training ships. For the next 5 years the ships sailed as training and cargo ships to South America but by 1957 the Pamir was in need of extensive repairs and money for this was short in the financial climate of the time. On her last voyage back to Hamburg she was caught in hurricane Carrie and sank, of the 86 aboard (mostly German cadets) only 6 survived. Hilary, a noted violinist himself, founded the International Musicians Seminars (IMS) with Hungarian violinist Sandor Vegh in 1972. These are still held at the family-owned, nearby Prussia Cove managed at the time by Hilary’s brother Michael (who played French Horn) and Michael’s artist wife Romi (another violinist). Since 1997 cellist Steven Isserlis has been the artistic director. In 2008 Hilary wrote a book about Sandor Vegh and the IMS. In 2017 the IMS celebrated Hilary’s 90th birthday with a concert at the Wigmore Hall. London. The inside back cover reveals the Morrab’s old-style loans system – each member was assigned a personal number and this was listed when the book was borrowed. Its evident how popular the book was! Thanks to our library member Dave Hill for his contribution. If you would like to review your favourite Morrab Library book for us, please get in touch!